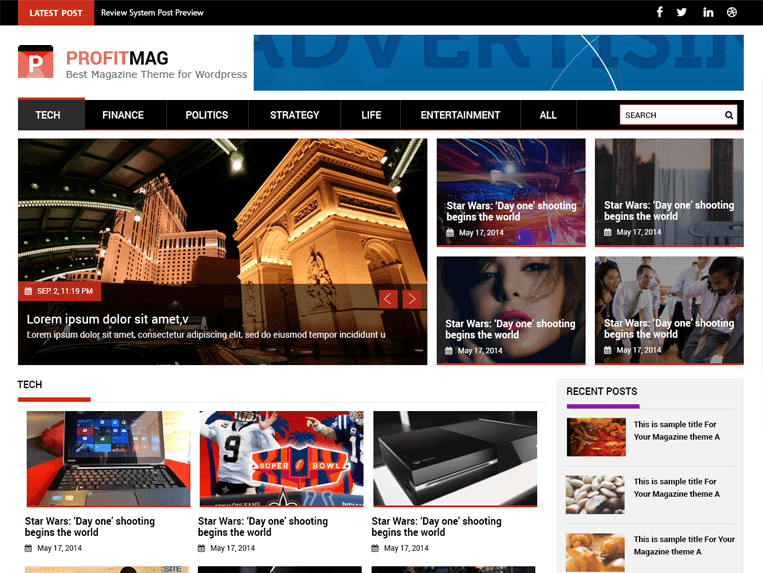 Hey Folks, Today I am introducing ProfitMag Responsive WordPress Theme to my readers. It is such an amazing design which forced me to write a post on it. But first of all, let’s talk about the benefits of having a good blog design. As you know, First Impression is the last impression. You can easily increase your sales. A good, fast loading design will result in Good search Engine Rankings. These are just few I have mentioned here, you will get many more benefits, if you use a quality responsive WordPress theme, but the question is, How can you find the design for your blog. Well, you don’t have to do anything, Because That’s why Today I am introducing ProfitMag Theme. It just have all the features, you may want for your blog. Want to know more about this theme? Let me explain it in brief. By Number of Mobile users increase day by day, it becomes very important for every blogger to use responsive layout which can adjust its size according to screen size. It’s the primary need for every blogger using WordPress and ProfitMag completes this need with it’s responsive design which easily adjust to any screen size. I have seen people finding it hard to edit their blog designs. But with this theme, you won’t need to worry about anything, because You can easily Edit background, adjust color, customize header or any other part of this theme according to your need. It’s just perfect for any Newbie who have less knowledge of editing. These days, people like to use Magazine themes, because they look great and attractive. If you are one of those, then ProfitMag is the best one for you. It gives your blog the best design. You can showcase multiple things on the Homepage and also, make it very attractive. So, these are some quality features of this awesome WordPress Theme. I Like each and every feature, especially Sticky Post, Threaded Comments and all those customizations. And I am sure, you will like it too. Because it will Fulfill your all needs, you will not need to buy any premium theme. In simple, Not need to spend those Big Bucks. Just use this design and save a lot of money. So, What you are waiting for? It’s time to grab this theme from the below given Link. And yes, If you face any problem with this theme, feel free to post it in the comments section here. So, we can convey your problem to the theme developers. I hope all the ProfitMag users will get beneficial from there. Hy developer. please tell me how i can change Latest POST to Latest News in this theme. can i show specific category post in Latest Post/News? Please forward your website using ProfitMag theme. Also, I cannot access the admin panel after copying database to this theme: test.techinamerica.com. Any suggestions? No doubt ProfitMag is a nice theme. But lately, I have not been able to edit the Theme Option. Please what could be the cause? You are not able to change the code of Theme Option . We have update 1.04 version already please check that there is extra more features and again we gone update the theme . That’s really an excellent template. I’ve seen it in a couple of event niche sites and also those which you handle 🙂 Anyways, I’m a silent spectator of this blog and cherish your success in the latest event which was handled by you all :). thanks bro this is really nice theme..
next post: What is an APN, and how do I change it in Android?